Stuffed chilii bajji is an awesome evening snack and feels more perfect during a rainy day. You can find this snack during evenings in almost in all South Indian streets. It goes well along with a cup of coffee or tea and the preparation process is also very easy. Again, you have different choices in stuffings. Today I will show one variety which is extremely easy to prepare which is very tasty also. 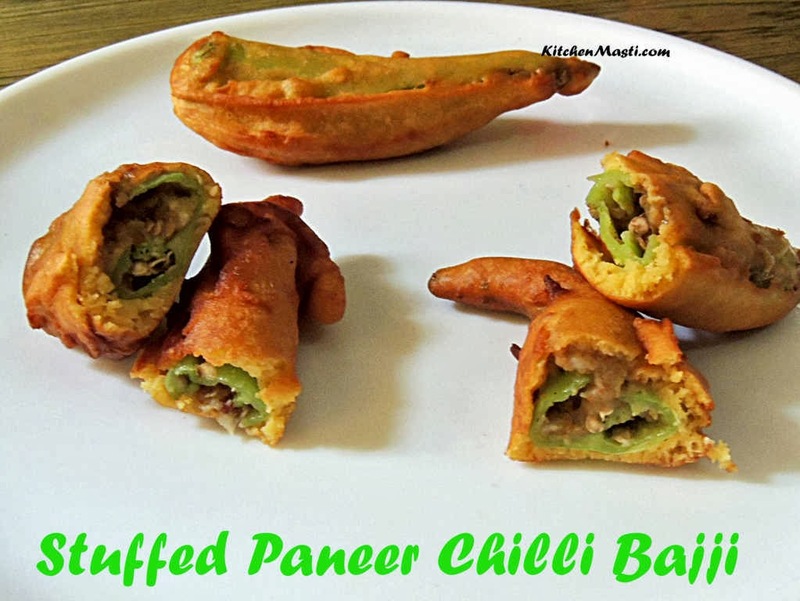 How To Prepare Stuffed Paneer Chilli Bajji. This snack takes around 10 minutes to prepare the batter and 10 minutes for deep frying the bajjis. Long green chillis - 6. Bengal gram flour ( besan ) - 4 tbsp. Jeera powder ( Cumin Seeds Powder ) - 1/2 tsp. Chaat Masala - 1/2 tsp. Paneer ( Cottage Cheese ) - 2 tbsp. Carom seeds ( ajwain) - 1/4 tsp. Method To Make Stuffed Paneer Chilli Bajji. Wash the green chillis and dry it thoroughly. Now slit the chilli in the middle with a help of a knife. In the mean time take a mixing bowl and add besan into it. Add salt carom seeds, cooking soda and rice flour in it. Add sufficient water and make a thick batter. Keep it aside for some time. Boil the potatoes and then mash it well in a bowl. Add salt, chaat Masala, lemon juice, Jeera powder and paneer to it. Mix well so that the masala is blended well with the potato mixture. Heat a big pan or Kadai filled with oil in it. Stuff the potato mixture in the chilli through the slit which we had already done earlier. Drop the chillis in the hot oil and turn it over till it reaches golden brown in color. Remove the chilli from the pan on an absorbent paper so that the excess oil gets drained off. Your hot and mouth watering stuffed paneer chilli bajji is ready to be served.!!! While mixing the besan batter you can add 1 tbsp of hot oil for additional crispiness. While selecting the green chilli we have to be bit careful. The dark long green chillis are very spicy so select the chillis which are light green in color. You can eat it with tomato sauce for a tangy taste. See to it that the besan batter is not too watery in consistency. You can also add 1 tbsp of processed cheese for a more richer taste.